Oh the joys of parenting a 2 year old and an 8 month old… Sometimes, I have to take them both to the grocery store with me and it ends up being a 4 hour event! So, I decided that for dinner, we’d have “whaddawegot” soup to get rid of the left overs and make room in the fridge. I initially thought, “slow cooker!” But I didn’t really have time. So I threw it all in a pot, boiled it for 15 minutes or until the veggies were soft, and then served it up. I was informed by my son that it was “yummy soup” so mission accomplished. 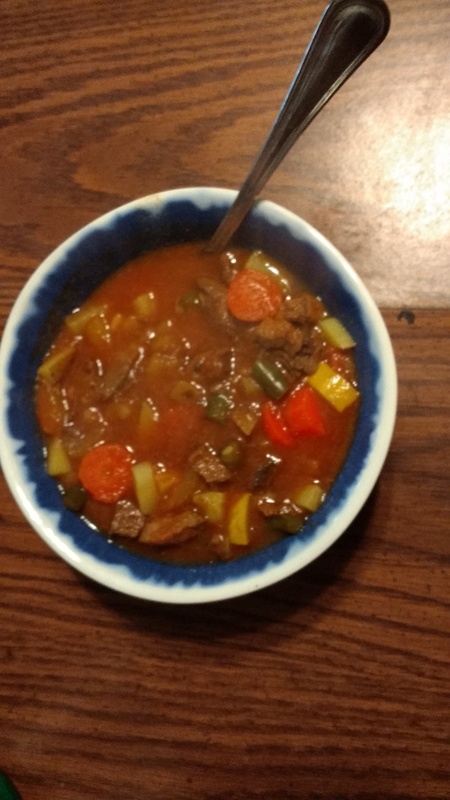 We call those suppers “hunter’s stew”. You just hunt around the kitchen and eat whatever you find. Its like a treasure hunt sometimes!